This letter was written by 34 year-old Pvt. 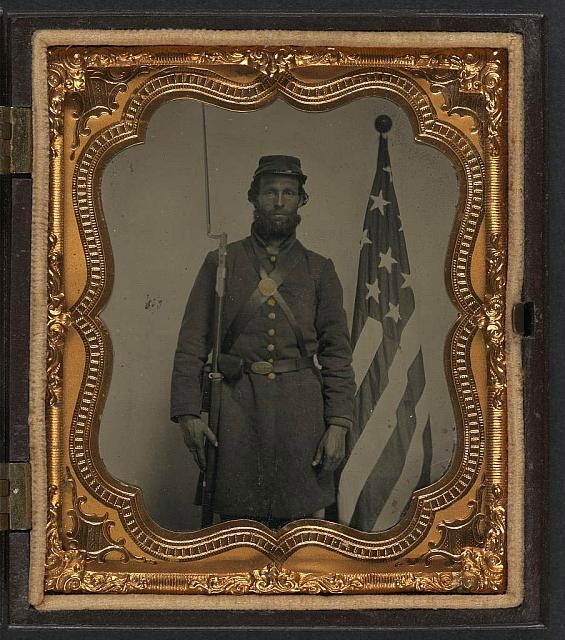 Samuel Cony Haskell (1831-1911) of Company G, 30th Maine Infantry. Samuel mustered into the service on 21 December 1863 and mustered out on 21 August 1865. He was the son of George Washington Haskell (1803-1855) and Eleanor Spratt (1801-1889) of China, Kennebec County, Maine. He was married to Mary Jane Cole (1833-1933) in 1854. Samuel wrote this letter while detached from his regiment on guard duty at the Round Top Signal Station near Winchester, Virginia. In May, he rejoined the regiment in Savannah, Georgia, where he was mustered out with the remainder of the regiment in August. Samuel was probably selected for this “light duty” assignment because of his age and/or health. I seat myself to write you a few lines to let you know that I am well and hope this will find you all the same. I have not heard from you since the 2d of this month and I don’t know when I shall for we do not know where the regiment is. Some say the have gone to New York and some say they have gone home. We cannot tell anything about it. We all want to get our mail very much but I don’t know when we shall. We are hoping to leave here soon and I think we shall for there is no rebel force around here now. They are all to home around here on parole doing their work and we want to go home too.